Game of Thrones features Daenerys Targaryen aka the Mother of Dragons. She has many titles including Khaleesi which means Queen, The Breaker of Chains, The Mother of Dragons, Queen of the Andals, Queen of Meereen and more. The people that report to her call her their Khaleesi. Danaerys is the Mother of Dragons to three dragons – Drogon, Rhaegal and Viserion. We saw in the last season, Viserion died when the Night King threw an ice spear that gave Viserion a fatal blow. He was seen spiralling to the ground and crashed through the ice and sinking into the water below. Khaleesi survived the fall. There is so much happening with Daenerys, I wonder if she will be Queen of the Seven Kingdoms at the end. I hope at the end she sits on the Iron Throne. 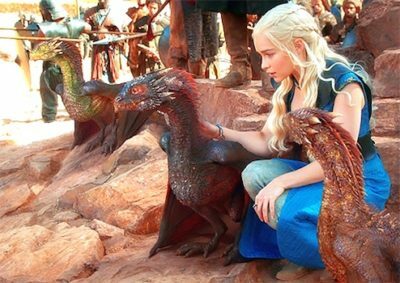 She, along with her dragons are my favourite characters in the show. 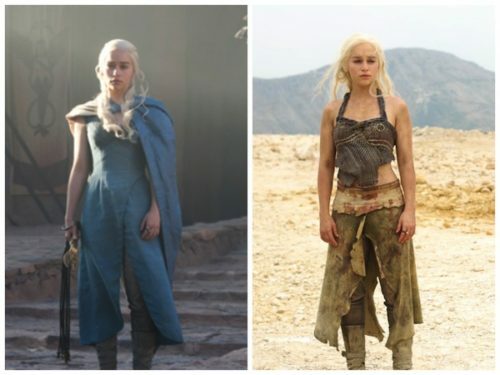 Find Khaleesi Daenerys Targaryen costume ideas below. The dark navy blue dress: Consisting of 2 layers – the lace layer and the satin layer underneath. The lace layer features a unique pattern and hollows with dimensional stability. The satin layer underneath is extremely smooth and soft with durability. The combination of the two layers gives it an elegant and mysterious feel. The white skirt:Made of chiffon is lightweight and durable, featuring an elasticated waistband, a solid color, and a long length, enriched by a pleated detailing. 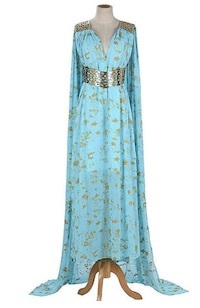 Game of Thrones Daenerys Targaryen Cosplay Blue Qarth Party Dress. Include:Dress+Belt. Dress exactly as shown as in the pictures. 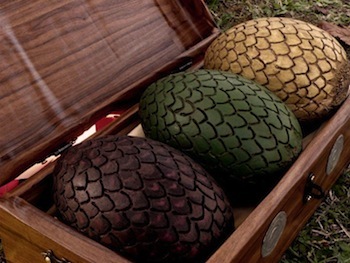 You will look beautiful and look like a Khaleesi ready to ride your dragons. Click here to get the GOT – Khaleesi Daenerys Cosplay Dress. This dress looks just like the one Khaleesi is wearing in the picture. Wearing this dress will transform you into the alluring, enchanting and powerful Mother of Dragons. Daenerys Stormborn of House Targaryen, First of her name, Queen of the Andals and the Rhoynar and the First men, Protector of the Realm, Khaleesi of the Great Grass Sea, Unburnt, Mother of Dragons, Breaker of Chains, Queen of Mereen! This Daenerys Wig is 100% Heat Resistant and comes with BONUS Dragon Necklace and FREE Wig Cap. Complete your Daenerys look with this perfect blond wig. 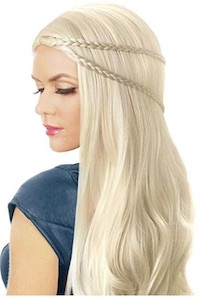 Click here to get the Deluxe Khaleesi Daenerys Blond Wig. Keep your dragons close. Wear it on your wrist. You can call on them at any time to help you get out of any situation. 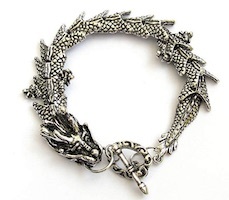 This is a great addition to the dragon accessories for the Mother of Dragon to keep your dragons close to you. This earring will look amazing on you. 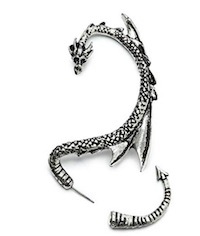 AND for the final piece of jewelry that you definitely NEED to get if you want to complete your Khaleesi look is this amazing dragon necklace. 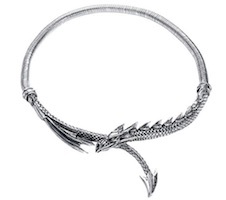 It’s a polished necklace of a spined dragon wrapping around the neck on a continuous chain. This will be the WOW piece of your Khaleesi costume.